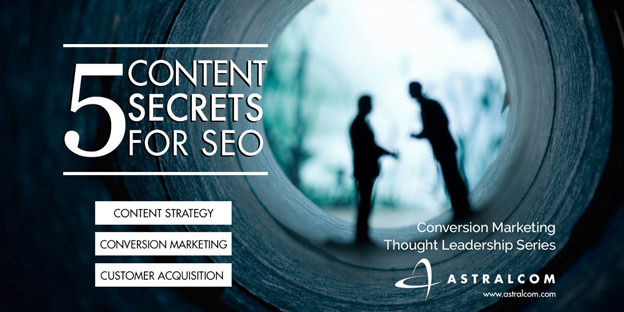 The 5 Biggest Secrets to Writing Effective Content for SEO | ASTRALCOM - Content Strategy, Conversion Marketing and Customer Acquisition. Our CTO, Erik, doesn’t write many articles. But when he does, it’s a definite worthy read. Check out this post he wrote on SEO and content. 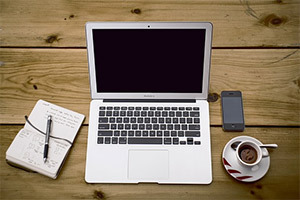 As professional marketers, you know it’s imperative to be producing high-quality content for your website. And yet, what if I told you that you’re most likely producing the wrong kind of content that isn’t crafted to rank well in search? With Google paying attention to hundreds of possible signals, you need to know the top 5 factors that Google is examining to determine if your content should rise to the top of the search results. This week, NewsCred.com published an article that really got me thinking about how to distill these factors down and make it easy for marketing folks to think in terms of the most critical ranking factors long before they start typing their first words. If high-quality content is half of the SEO equation, the other half is high-quality links to that content. Earning links to your content is going to depend highly on how exciting and/or engaging your content is. When you’re planning your content marketing calendar, try to think about what bloggers, journalists and influencers tend to link to, and then build your content specifically to appeal to that audience. Write long-form without targeting a specific number of words. Keep in mind that 500+ words is probably a good low threshold, but if you can get yourself excited about a particular topic, I bet you can produce far more. And the longer, the better, when it comes to SEO. Try to research or produce something original that other people aren’t already discussing, or if they are, come at it from a different angle. Content that’s controversial, forward-looking, offers insight from an industry leader, or discusses some unique data you’ve either compiled or come across, all offer a way to get your audience excited and get them wanting to share your content. Google’s RankBrain has been described as a “machine-learning artificial intelligence system that’s used to help process its search results.” While Google is notoriously secretive about how key facets of its search algorithm works, we know that RankBrain excels at discovering content that’s conversational and natural sounding. RankBrain is likely a counter-measure against spammy content spun by a computer, or by someone interested in generating long-form content with little actual work and even less creativity. To avoid running afoul of RankBrain, be sure to write in a conversational tone. It’s even recommended that you read your final piece aloud to help determine if your language sounds natural. I’d be willing to bet that if you’ve asked Google Search a question, you’ve likely seen an answer to your question at the top of the search results. For example, when I search for “How to cook pumpkin bread,” a short snippet of recipe appears at the top of my results, along with a thumbnail photo and a link to AllRecipes.com. While this is quite handy for the search user, marketers were horrified when these featured snippets began appearing. Initially, it was thought that if a featured snippet from their site made it into the results, they would surely lose traffic as a result. And yet, research is starting to show that the exact opposite is happening. Featured snippets of your content could lead to an increase of 20-30% in site traffic. The reason why seems pretty obvious to me. Oftentimes, a featured snippet is simply too short to completely convey all of the information to the search user. And so, they naturally click on the snippet to visit your site and gain access to all of the information. In my example above, perhaps the snippet gave them the first few steps in a particular recipe, but if they truly wanted to bake some pumpkin bread, they’re going to need to click through so they can see the ingredient list, watch a video of the recipe being made, learn what other people thought of the recipe and so on. There’s no guarantee your site will be included in featured snippets, but if you go out of your way to answer questions, in particular complex questions related to your industry, you stand a good chance of being included. When producing a new piece of content, consider your primary topic. Let’s use “Pumpkin Bread” from my previous example. Google specifically looks to see if you’re also using other key terms that are closely related to your primary keyword or topic. Given that knowledge, you might want to consider including mentions of Fall Recipes, Thanksgiving Recipes, Chocolate Chip Pumpkin Bread, Best Breads for the Holidays. So long as you can do it naturally, including related words and phrases improves the well-roundedness of your content and demonstrates that you’re not just focused on one narrow topic. Search engines will likely notice this and when search queries such as “Best bread recipes for the holidays” start rolling in, your content seems more relevant as a result. One of the metrics that is super easy for Google to monitor, is how many Google Search users click a particular result only to quickly return to the results and click other results. Your site’s bounce rate is a big factor that Google clearly pays attention to. If search users are bouncing from your site after being delivered by search, Google will interpret this as a bad user experience and ding your search ranking as a result. If your site visitors are having a bad experience (a site not optimized for mobile on a smartphone, for instance), or they just aren’t getting the information they expected, your bounce rates will skyrocket and your search positioning will take a hit. That said, it pays to monitor post-click KPI’s carefully. If you see overall bounce rates that are high, it could indicate a user experience problem with your site in general. If you see high bounce rates on a particular piece of content, it probably means that your content is ranking well for a particular search query, but maybe one that isn’t relevant to your topic. You could try re-writing that content, elaborating on it further, or perhaps even reconfiguring it to support an entirely different key phrase. 1.) Create good content that people want to link to. 2.) Optimize for RankBrain by using a natural, conversational tone in your writing. 3.) Try to appear in featured snippets by answering (preferably complex) questions on your site. 4.) Use contextually-related topics and words in your writing. 5.) Pay attention to user experience, in particular monitor bounce rates on your content pages. How Do You Drive a 53% Increase in Revenue Without Mentioning the Product? Are Millennials Even Interested in the American Dream?